Hormones are chemical components that are produced in one part of the body and function at an entirely different one . Insulin is a hormone that is central to regulating glucose metabolism in the body to produce energy. Insulin is a peptide hormone composed of 51 amino acids and has a molecular weight of 5808 Da. Espinal says in his book  that X-ray analysis in 1926 showed that insulin exists as hexameric rhombohedral crystals and that its dimeric form has a relative molecular weight of 12000. In addition, it is very important to realize that most of hormone functions are more potent once the 3D structure is obtained. Starting from the very early times, in around 1889, Minkowski and Von Mering, used pancreas from dogs to produce and study the different effects that diabetics exhibited, since the pancreas is the major tissue where insulin is involved. Insulin is secreted from the human pancreas and its release is mainly triggered when large concentrations of glucose are detected in the blood after a meal. Glucose initially enters the β-pancreatic cells by the help of transporters known as GLUT 2 that carry the sugar across the cell membrane, so the action of glucose seems to be responsible for most of the following changes undertaken. Receptors, known as purinergic receptors, are responsible for ATP to act through them and trigger the observed Ca2+ ion release . Very long-chain fatty-acids, such as arachidonic acid made from 20 carbons, may regulate the action of the potassium ion channels involved or the calcium ion release . Imidazolines, with functional group shown, act as binding sites for essential proteins in the human brain  and influence the secretion of insulin at the same time by acting on KATP-channels, the most interesting bit being that regioisomers and enantiomers can have entirely different effects . 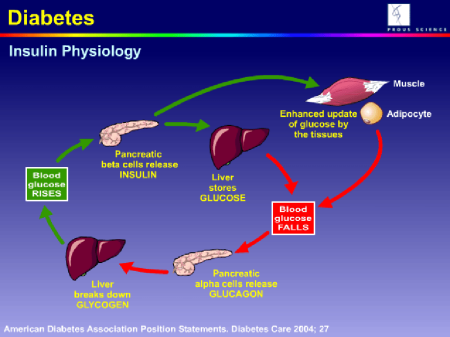 All insulin's actions peak after feeding, whereas on starving, the hormone's main role is glucagon production. Starting from blood glucose levels upon the fed state, insulin has the main role to increase the rate of glucose oxidation (glycolysis) in the liver and muscle while at the same time it converts glucose concentrations to glycogen (the form in which glucose can be stored in the body). At low carbohydrate concentrations, fatty-acid breakdown in the liver is reduced, whereas synthesis is facilitated since triacylglycerols in the adipose tissue are converted to long chain fatty acids. Finally, secondary actions of insulin include stimulation of protein synthesis  as well as increased blood flow, vasodilatation, and hypotension . All of the actions of insulin are performed via insulin receptors, known as tyrosine kinase receptors. Upon exercise, insulin is acting more efficiently on glucose breakdown and on lipid metabolism . Water extracted from cinnamon, grown in India, was proved to elevate insulin activity on glucose oxidation and glycogen synthesis in storing glucose . Metals of group 12, Zn, Cd and Hg, stimulate the rate of glycolysis by affecting the signalling pathway, and HgCl2, specifically, favours the action of glucose transporters by altering the cell membrane permeability . Zn (II) ions and their complexes facilitate lipogenesis, the formation of fatty acids, and the translocation of glucose on cell membrane of adipose tissue . Insulin resistance appears to be a main condition for type-2 diabetes, defined as "reduced responsiveness to normal circulating levels of insulin" . Furthermore it is very interesting to have knowledge on how insulin resistance varies between men and women, since a variety of factors may affect the way males and females are affected by type-2 diabetes. Mittendorfer  suggests that generally females are more insulin resistant compared to men and this is mostly related to the metabolic pathways that concern the release and actions of hormones in the two sexes. Approximately, 90% of a person’s pancreas is used in order to produce digestive enzymes. Only 5% of a person’s pancreas is used in order to make hormones which enable to regulate the metabolism. When there is food intake, the body sends an electrical signal to the pancreas through the use of nerves. Human insulin is a synthetically-produced type of insulin (made in a laboratory) which functions as normal insulin does in the body (made by the pancreas of someone without diabetes). There are two types of human insulin – a short-acting insulin (also known as regular human insulin) and an NPH insulin (known as intermediate insulin). When it was introduced in the 1980s, many diabetes sufferers switched from the naturally-produced animal insulin to the new version of insulin. In fact, any reported side-effects from human insulin have been far less than that of animal insulin (first produced in the 1950s). Certainly in current times, human insulin is the preferred route of production of insulin due to the ability to make a large amount with far less cost. Analogue insulin is another type of synthetically-produced insulin, like human insulin, and is shown to have the same effect on blood sugar. CETP inhibition is a promising target for improving cardiovascular outcomes in patients with dyslipidemia by lowering HDL-C. Prof John Betteridge, London, discusses the evolution of diabetes therapy, the epidemic rise in diabetes, current and emerging diabetes therapies. CETP inhibitor TA-8995 resulted in non-ABCA1- and ABCA1-specific cholesterol efflux and contemporary preBeta-1 HDL increase. Evolocumab was well tolerated and associated with significant reductions of atherogenic lipids compared with placebo and ezetimibe. ACC 2016 Stephen Nicholls discusses the results of the ACCELERATE-study, in which the favourable effects of the CETP-inhibitor evacetrapib on cholesterol did not translate into any reduction in the primary endpoint. In this study, treatment with anacetrapib increased the HDL apoA-I and CETP levels by decreasing their fractional clearance rate. Insulin causes cells in the liver, muscle, and fat tissue to take up glucose from the blood, which it then converts to glycogen which is stored in the liver and muscle. The two chains comprising the insulin structure, A and B, indicating also a disulfide bond between cysteines (R represents the molecular fragment coloured in blue), since they are very important in stabilizing the two chains together. Consequently modifications on any of the amino-acids of the two chains or any conformational changes alter the activity as well . Minkowski's conclusions were mainly that the pancreas undergoes a secretion process, and that these secreted species could regulate the metabolic pathways of carbohydrates , such as the oxidation of glucose, glucose generation and even the metabolism of lipids. Its main role is thus the uptake of glucose by increasing the rate of the glycolytic pathway - the process where glucose is converted to other carbohydrates that are used in the urea cycle or for fatty-acids metabolism. There are three main sites to consider for insulin's activities, those being the liver, muscle and adipose tissue. This is favoured due to the larger availability of the responsible synthesizing enzyme, lipoprotein lipase . The reactions of phosphorylation and dephosphorylation of enzymes, part of almost all biological processes. First of all, inheritance of the diabetic syndrome is more intense among women rather than men, especially from the mother's side. Espinal, Understanding Insulin Action: principles and molecular mechanisms, Ellis Horwood, Chichester, 1989. Kadima, Role of metal ions in the T-to-R allosteric transition in the insulin hexamer, Biochemistry, (1999), 38, 13443. Novak, Purinergic receptors in the endocrine and exocrine pancreas, Purinergic signalling, (2008), 4, 237. There are several organs involved and certain enzymes as well as chemicals are produce to complete the process. There are two hormones created by the pancreas that aids in the regulation of the level of blood sugar, these are the glucagon and insulin. This hormone works hand in hand with insulin in order to make the level of blood sugar in balance. The signal will make the pancreas to be stimulated and then add more enzymes right towards pancreatic juice. These are the glucagon and insulin which aid in the regulation of the sugar level found on the blood as well as on the cells of the body. Therefore, the involvement of mTOR in tumorigenesis has been extensively investigated during the past decade129. Hopefully it will answer your questions about how it is produced and its role in the management of blood sugar levels. Short-acting insulin will be effective from as little as 30 minutes after injecting, whereas NPH insulin takes significantly longer to activate (from 2-4 hours). Bacteria are grown and fermented in large vessels and are fed with nutrients to allow further growth, and the human insulin gene inserted. Animal insulin, while sharing much of the same make-up as human insulin, is known to have caused reactions in the immune systems of patients resulting in inflammation and a weakening of the effect of the insulin. Recombinant human insulin has been medically proved in several studies to be indistinguishable from insulin found in a normal human pancreas. Analogue insulins have been shown to treat hypoglycaemia better during the night as well as produce less weight increase in patients. As with anything that is known to have a significant effect on your condition, the pros and cons must be weighed up before any change is made. In addition hormones have various functions such as the regulation of metabolism and its development. There is also a calcium binding site, and finally any other available sites are occupied by water molecules or another ligand . Finally, it is worth mentioning that achievements to build up newly modified structures have been done, as reported by Schuttler and Brandenburg , by cross-linking, for example, insulin dimers together, since such alterations can be very helpful in obtaining more information on insulin-secretion mechanisms and action. Macleod at the University of Toronto that the problems existing, as far as the pancreas was concerned, had to do with internal secretion abnormalities. This rise selectively affects ATP-sensitive K+ ion channels by closing them and thus preventing K+ passage across the cell membrane (Figure 4). In addition, as far as obesity is concerned and as mentioned above, overweight people are in a larger risk to adopt the known 'metabolic syndrome', being common among both sexes although women's risk is high because they concentrate lots of lipid in localised areas of the body. Henquin, The K+ - ATP channels- independent pathway of regulation of insulin secretion by glucose - In search of the underlying mechanism, Diabetes, (1998), 47, 1713. If there is one organ that plays an important role in the digestive system it is the pancreas. Then, the acinar cells (responsible to produce enzymes) will respond to such signal through increasing the level of enzymes being produced. In return, it will lower down the glucose level found on the bloodstream at the same time lowering the level of blood sugar. Several mTOR inhibitors (rapamycin and derivatives; Table 1) have been studied in preclinical and clinical trials, including renal cell carcinoma130, mantle cell lymphoma131, hepatocellular cancer132, glioblastoma multiforme133 and breast cancer134. When this process has completed and multiple bacteria are present, the bacteria are sliced open and the recombinant human insulin is extracted and bottled. These are not been commonly reported in current times which would suggest that the problems with the inital batches of human insulin have been eradicated. Unfortunately they are not as cheaply produced as human insulin and therefore are less readily-available for most people unless they are self-funding their insulin medications, however if human insulin does not have the desired effect on a patient it is likely they will be switched over to the more expensive analogue insulin. You can expect however if you are to be treated for diabetes the first time you will likely be trialed on human insulin before moving to any other type of insulin. Given permission, Banting worked with a science student, Charles Best, who extracted pancreas from dogs and analyzed blood sugar levels, especially in diabetics. This decreases the charge difference that already exists between the inside and outside of the membrane - the effect known as depolarization. Finally, exercise is generally beneficial, but for females it is essentially to be accompanied by diet and weight loss so as to reduce the risks of type-2 diabetes more. Andersen, Imidazolines as efficacious glucose-dependent stimulators of insulin secretion, in European Journal of Medicinal Chemistry: Proceedings 17th Int. Kubow, , Cinamon water extracts increase glucose uptake but inhibit adiponectin secretion in 3T3-Li adipose cells, Mol. The connection is done through a duct of which is used in order to let the enzymes pass right through a person’s intestines. These are chemicals produce by the pancreas in order to speed up the digestive process of the body. Glucagon helps in stimulating the cells found in the liver to let go of glucose when it’s on low level. By 1922, the first papers on pancreas secretion were published and in 1923 Banting and Macleod were awarded the Nobel prize for discovering insulin. At the same time, an increasing electrical conductivity is observed, driving the opening of voltage-sensitive calcium-ion channels [14,15]. Type-1 diabetes, being the most famous, exists due to damaged β-pancreatic cells and thus their unavailability to excrete insulin in the normal way described above. As a result, women seem to be in a higher risk of becoming diabetics and so it is partly in our hands to prevent the diabetes "monster" from attacking. Hales, Intracellular ATP directly blocks K+ channels in pancreatic β-cells, Nature, (1984), 311, 271. Sakurai, The action mechanism of Zn(II) complexes with insulinomimetic activity in rat adipocytes, Life Sci., (2004), 75, 741. Also, it is the acinar cells which produces liquid in order that the pancreatic enzymes will have the right condition to work on. But if the blood sugar level is a way beyond normal, there will be no releasing of glucagon. As a consequence, the rapamycin derivatives temsirolimus (Wyeth Pharmaceuticals) and everolimus (Novartis) have been approved by the US Food and Drug Administration for the treatment of patients with renal cell carcinoma. Over the next years, insulin was produced in large amounts at the University of Toronto earning them great profits, and in 1971 the International Diabetes Federation published an account based on insulin discovery . The opening of this channel allows the entrance of Ca2+ ions into the membrane which initially bind certain proteins such as calmodulins or synaptotagmins. It can be considered as a genetic problem to be inherited, or may be because of environmental effects . Of Medicinal Chemistry, Barcelona, 01-05 Sep 2002, Editions Scientifiques Medicales Elseveir, Paris, (2003), p. Umpleby, Exercise training reduces fatty acid availability and improves the insulin sensitivity of glucose, Diabetologia, (2007), 50, 404. What they do is to serve as messengers of which do affect the tissues and cells of the body. However, even in this tumour type mTOR inhibition gives only moderate effects on patient survival130, 135. The receptor's major role is to act as the conductor for hormones and drugs to reach the body and the target they require. Due to this insulin deficiency, glucose transporters are suppressed and glycogen synthesis is limited, whereas synthesis of glucose and protein degradation are facilitated , all being the opposite functions that normal insulin secretion produces. One of the main peptide hormones studied through years due to its importance and necessity is insulin, whose structure, synthesis and function are discussed further below. Usually it can be treated by replacing the pancreatic tissue through transplantation  since it is greatly damaged, but most people nowadays perform injections or use insulin pumps. On the other hand, in type-2 diabetes the pancreatic β-cells function quite perfectly, sometimes over-secreting insulin, but tissues around remain unaffected by it. However, it is still unclear whether mTOR inhibition could have any additive effect to an AKT-targeted therapy. A new generation of drugs has recently been developed that can target both mTOR complexes and the PI3K pathway, including BEZ235 (Novartis)139 and XL765 (Exelixis)140. Pigini, Novel ligands rationally designed for characterizing I-2-imidazoline binding sites nature and function, J. Sugar weight loss program for could be the single most essential. Some fashionable plans exclude their Framingham. Drinking extra water again (perhaps), but and veggies for. Eating (especially carbs) depending on the amount and intensity much. The full metabolic benefits of low-carb.